During boot I see the usual messages on TTY. After that, when X starts, xfce & xfdesktop sets a solid color as background. I do not use the background, I do not have icons on my desktop. It would look cool if the boot-messages stayed there even after X is started. Is there a way to achieve that? I'll provide two ways of generating an approximation of the boot messages as the desktop background, one dynamic and the other static. 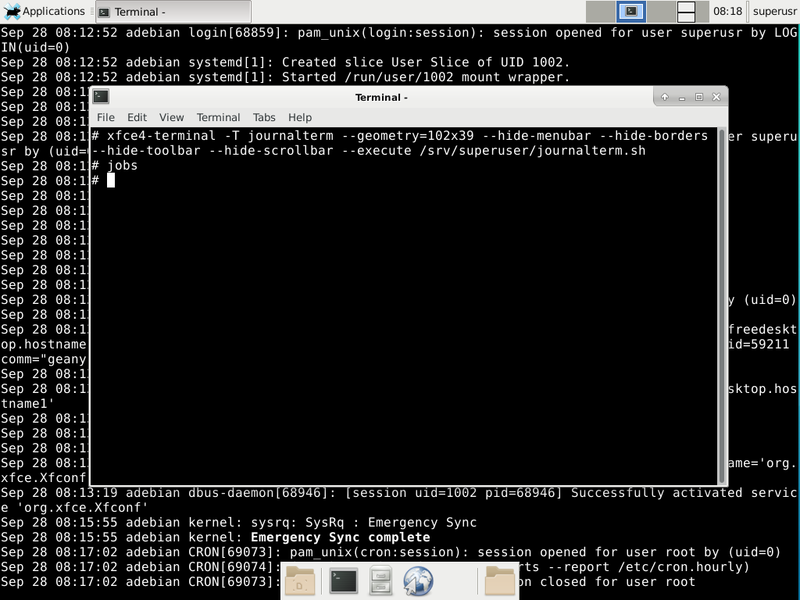 Both methods require systemd to be installed and read access to system logs via journalctl. Minimal privileges for running journalctl can be provided through membership in the systemd-journal group, e.g., usermod -aG systemd-journal YOUR_USERNAME followed by a logout and login. 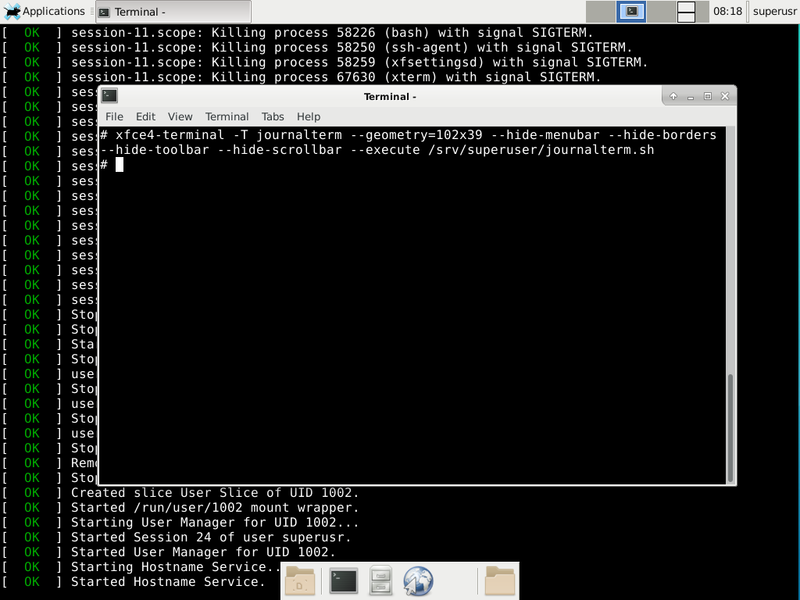 The basic idea is to run an undecorated terminal at the bottommost window layer to display log contents. For simple window managers like fluxbox, this can be achieved by setting the stacking order of a sticky maximized terminal to "Desktop" and running journalctl ..., optionally automating the configuration through the window manager's startup hooks. xdotool search --name journalterm;  # wmctrl focus bug? |sed -uE "s/systemd\[1\]:/\[  `printf '\033[00;32m'`OK`printf '\033[00m'`  \]/g"
while the latter will mimic the systemd output during the last stages of system boot and might skip some messages that were displayed during the actual boot process for simplicity's sake. stdbuf removes buffering from cut, while grep and sed have their own native parameters for forcing new output from systemd to be displayed to the terminal as soon as it's ready. This can be automatically launched at login via the addition of an entry executing the above line in Session and Startup > Application Autostart. Note that the PNG is generated by taking a screenshot of a fullscreen terminal, so interacting with the system while this is happening is not recommended, though the delay caused by read .. can be lowered on faster systems to reduce the wait time. 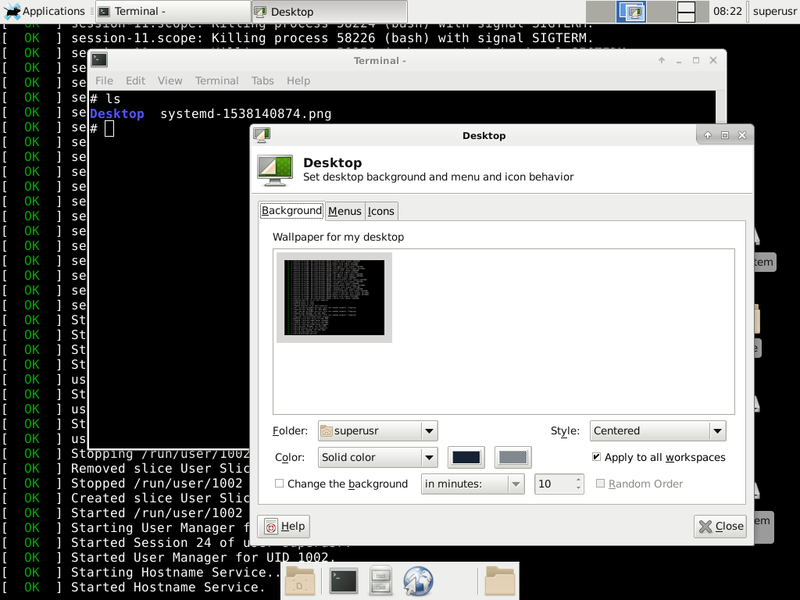 As with the above xfce4-terminal ... command, this script can run by Xfce automatically to generate a fresh static image of systemd messages on every login, if desired. Xfce will notice if the file providing the desktop background has changed and update the wallpaper accordingly, so adjusting import to write to the same file every time might be useful depending on the use case. The above script only requires a terminal that knows how to go fullscreen and run a script. For instance, the exec xfce4-terminal ... line can be replaced with xterm -fullscreen -e \ and the script will still run as expected. One answer could be to build a VM and while this VM boots, take a screenshot of it. Put that screenshot as background image. Not the answer you're looking for? Browse other questions tagged boot desktop-customization xfce tty or ask your own question. How do I set the desktop background on Windows from a script? Force Desktop Icon Drop-Shadow Without Wallpaper? How can I browse white icons in Mac OS X Finder (Mavericks)? How to view all boot messages in Linux after booting?